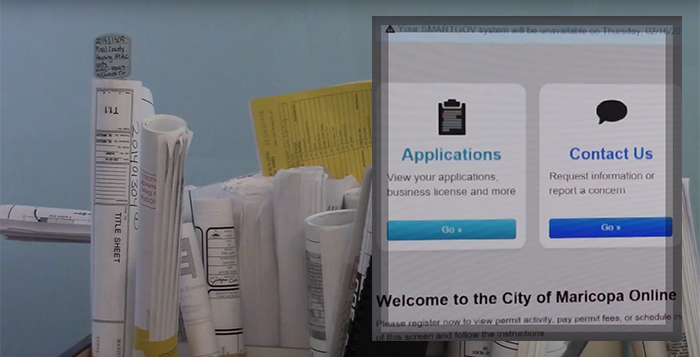 Departments within City Hall are cutting paper by going digital – and while officials say this move helps the environment, it also helps applicants save some green, too. The new online program called The City of Maricopa Online Services stores the digitalized documents and applications in various divisions in the city including: building permits, land-use planning, engineering, fire inspection and business permits. Customers who access the site can pay permit fees, check statuses of permit applications and apply for business licenses, among other services — all without having to travel to City Hall. City officials are still working to scan what’s left of the paper archive. Robert Mathias, development director for the city, pulled giant rolls of paper out of the one shelving unit that still houses the remaining old-fashioned paper plans that await the digital transition. The rolls are thick, heavy and expensive. Each sheet in the roll of about 20 cost around $3 each. However, soon all of the plans will be digitalized, and the cost of printing new plans is zilch. “This is a real savings for our customers and it is also a very green program,” Mathias said. The city estimates it will save applicants nearly 400 tons in paper per year. It also expects the program to stimulate the private sector as well. Economic Development Director Denyse Airheart said business license applicants who apply online can often expect a faster approval than before. “If they can open up their doors three months, two months, one month earlier than what they had projected, that’s more money in their pocket and that’s more money in our pockets,” Airheart said. The public can access the online services by visiting https://ci-maricopa-az.smartgovcommunity.com/Public/Home.